Calibration modeling is a complex and very important part of NIR spectroscopy, especially for quantitative analysis. If the model is badly designed the best instrument precision and highest data quality does not help getting good and robust measurement results. And NIR Spectroscopy requires periodically recalibration and validation. How are NIR models built today? In a typical usage in industry, a single person is responsible to develop the models (see survey). He or she uses a Chemometric software that has a click-and-wait working process to adjust all the possible settings for the used algorithms in dialogs and wait for calculations and graphics and then to think about the next modeling steps and the time is limited to do so. Do we expect to find the best use-able or optimal model that way? How to develop near-infrared spectroscopy calibrations in the 21st Century? Why not put all the knowledge a good model builder is using into software and let the machines do the possibilities of calculations and presenting the result? Designing the software that way, that the domain knowledge is built-in, not just only the algorithms for machine learning and make it possible to scale the calculations to multi-core computers and up to cloud servers. Extend the Chemometric Software with the Domain Knowledge and make as much computer power available as needed. Note that the “Domain Knowledge” here does perfectly support the User’s product and process knowledge to get the things done right and efficient. The hard part in doing this, is of course the aggregation of the needed domain knowledge and transform it into software. The Domain Knowledge for building Chemometric NIR Spectroscopic models is well known and it’s huge and spreads multiple disciplines. Knowledge-driven software for computing helps to find the gold needle in the haystacks. It’s all about scaling that makes it possible. See Proof of Concept. NIR users can get help working more efficient and getting better models. New types of applications for NIR can be discovered. Evaluation of NIR Applications to replace conventional analytical methods. Hopeless calibrations development efforts can be re-started. Higher model accuracy and robustness can be delivered. Automate the experimental data part of your application study. Person independent optimization will show new solutions, because it’s not limited by a single mindset => combining all the aggregated knowledge and its combinations. Software independent optimization will show new solutions, because none of vendor specific limitations and missing algorithms are present => combining all open available algorithms and there permutations. Chemometric software competitions (aka shootouts) are a good way to check algorithms, software and knowledge against all other experts in the field. Imagine that the prediction results can be produced with any kind of software and newest algorithms. And we just use PLS right to generate models that can be used on all NIR software systems, because PLS is a quasi standard, supported in all major chemometrics software. Our software framework reached very good results, got gold (rank #1) and silver (rank #2) during well known international NIR Chemometric software shootouts* so far, the competitions are held bi-annual. A set of NIR spectral data will be available for downloading from the ANISG website and contestants will be asked to find and explain a “best” chemometric model to robustly predict samples of the same type. A panel will select the three “best” entries based on the predicted results and spectroscopic explanation of the products and attributes of interest. The Software Shootout has been a staple of the IDRC. It is a competition amongst participants of the conference that aims at determining the person who developed the best model and obtained the lowest prediction error for a particular problem. Every IDRC, a new challenge is proposed to participants. The challenge consists of a data set with calibration, test and a validation set. Participants are given target values for the calibration and test sets but must do their best to develop a model that will predict the validation set as accurately and precisely as possible. Challenges from all sorts of fields of NIRS have been used (agriculture, biomedical, pharmaceutical, soil, …). *) The author was unable to present the results at the conferences, so this ranking was not official but confirmed by the shootout organizers. Thanks go to Benoit Igne, IDRC 2012 shootout organizer and Steve Holroyd, Kaji Competition organizer at ANISG Conference 2012. Our chemometric software framework can significantly reduce the time spent for NIR method development and fine optimization. The time saving can be achieved through highly automated experiments and the usage of cloud computing. Calibrations are built and evaluated using automated good practices protocols resulting in useful, precise and robust Calibrations. The high number of experiments enables a deep screening of the solution domain to find the optimum calibration settings, something currently unavailable in standard chemometric software. **) We were the only participator that got the 4 competition tasks (4-times more than usual) completed in that short time and submitted the fully documented results. After the competition, the information was given, that the data was originated from forages and the constituents were dry matter, organic matter digestibility, protein and ash. Thanks go to Daniel Cozzolino, Kaji 2014 Competition organizer. that are partly available as modules for software packages like Matlab, Octave, R-Project, etc. Why invest a lot of time and money with new tools? 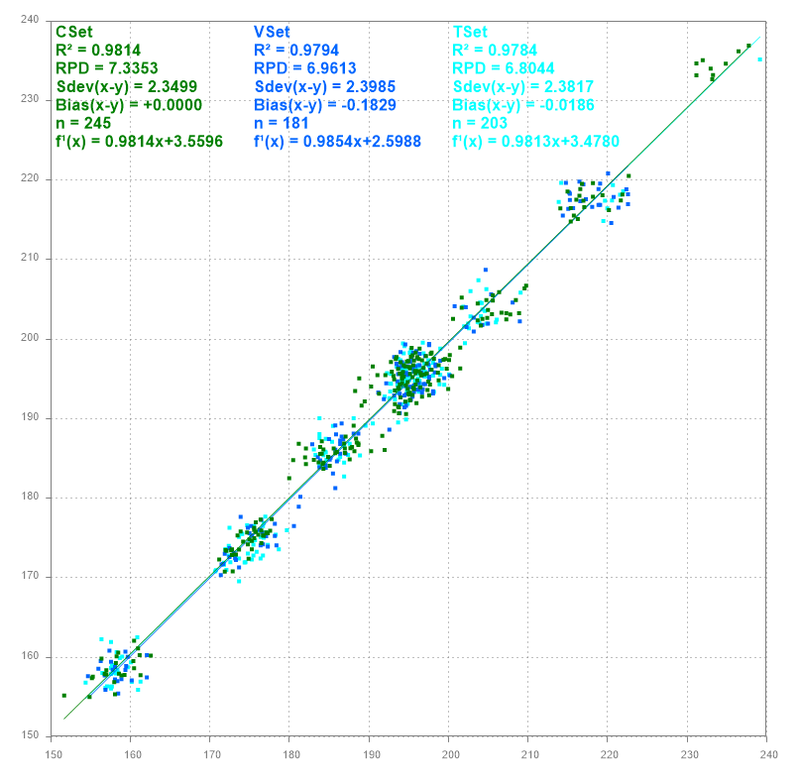 Have you tried it really hard to optimize your calibrations with standard chemometrics methods like Partial Least Squares (PLS), Principal Component Regression (PCR) and Multiple Linear Regression (MLR) which are available in all chemometric software packages? Are you sure you have tried all the good rules and optimization possibilities? Get it done right with the compatible standard methods, we are specialized in optimization and development of NIR calibrations, let us help you, give us a try!